FULTON, NY – Karrie Damm, executive director of the Child Advocacy Center of Oswego County, announced that the agency’s inaugural Chicken Wing & Micro-Brew Fest raised more than $6,000 to help support the agency’s efforts to combat and prevent child abuse in Oswego County. Autumn Harrington was the lucky winner of the Child Advocacy Center’s “Big Game Package.” Harrington won the prize during the CAC’s inaugural Chicken Wing & Micro Brew Fest held Feb. 4 at GS Steamers in Oswego. 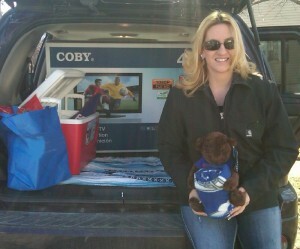 The prize package included a Colby 40” HD-TV courtesy of Tirrell’s Appliance, 11 E. Utica St., Oswego. “Our Chicken Wing & Micro-Fest was a great success! Thanks to our many supporters and the more than 300 community members who attended the event, we raised some much needed funds that will allow us to continue to provide services free of charge to victims of child abuse in Oswego County,” said Damm. A non-profit organization, the CAC works hand-in-hand with local law enforcement, prosecution, child protective services, medical providers, therapy providers, and victim advocacy professionals in Oswego County to protect and serve children that are victims of sexual and physical abuse. In 2011 the CAC served 384 children and families in Oswego County. “We truly appreciate the support we received from our Board of Directors and our event sponsors: Oswego Federal Credit Union, Pathfinder Bank, Oswego Printing, Legislator Amy Tresidder, Legislator Jake Mulcahey, Tirrell’s Appliance, CNY Marriage & Family Therapy Place, Fisher Signs, The Foundry, Pinnacle Builders USA, Inc., and CSI. We are also thankful to GS Steamers for hosting the event, Eagle Beverage for providing the micro-brews, and of course The End Zone, Canale’s Restaurant, Cheap Seats Bar & Grill, The Shed, Lighthouse Lanes, Franco’s Pizza, and GS Steamers for providing a delicious assortment of chicken wings! Their participation clearly demonstrates their concern for the children in this county and their support of our efforts. It is through the generosity of outstanding community sponsors like them, that we are able to provide many free services to children at the CAC,” said Damm. For more information on the Child Advocacy Center of Oswego County, call 315-592-4453.